The Kalinga region (modern day Odisha)was freed from Mauryan influence after Asoka’s death and the inscription on the Hathi Gumpha represents King Kharavela as a great scion of the Cheti race who was a Jaina by birth. He is connected with the Mahameghavahana dynasty and third king in the royal family of Kalinga. Maharaja Vakradeva was Kharavela’s father who was the lord of Kalinga. Various historians have assigned a date of 4th century B.C to 1st century A.D.
Udayagiri and Khandagiri caves which are near Bhubaneswar in Odisha were made during the rule of King Kharavela for Jain monks and are of archaeological and historical importance. There are a total of 18 caves. The Hathigumpha (Gumpha means cave)is one of the caves and the inscription on it mentions the prince spending fifteen years learning the arts of correspondence,currency, laws and understood different areas of knowledge. He became yuvaraja at the age of sixteen and became king at twenty five. As per the inscription he undertook public works in his first year. From the second year he began military conquests. In his second year he sent a huge army to Satavahana territory and disturbed the peace of the city of the Musikas. In his fourth year as king ,he occupied a capital of a prince called Vidyadhara and defeated the Rastrikas and Bhojakas of Berar. In his eight year Kharavela attacked and destroyed Gorathagiri, a hill fortress in the Barabar Hills near Gaya and sacked the city of Rajagriha or Rajgir. In his eleventh year King Kharavela destroyed the city of Prathuda, the capital of a king in Masulipatnam and also defeated Bahasatimita, the king of Magadha. He also defeated a Pandya king. In his thirteenth year, along with his queen Sindhuja he held a Jaina congregation and presented gifts to Jaina monks. The first cave is called Rani Gumpha. It is believed that the queen of Kesari king Lalatendu lived in it. The other caves are the Bajaghara gumpha,Chota hathi,Alakapuri,Jaya-Vijaya,Panasa,Thakurani,Patalapuri,Swargapuri,Manchapuri, Ganesa,Jambeswar, Bagha,Sarpa,Hathi (already mentioned),Dhanaghar,Haridasa,Jagannatha and Rasui Gumpha. An impressive cave ,Rani Gumpha is a two storeyed monastery with an open south eastern side. Each storey has three wings with a larger central wing.The lower floor has seven entrances in the central wing and the upper floor has nine columns in all and two pilasters. The central wing’s upper portion has frieze depicting victory march of a king. The connecting area between the right and left wings have friezes with a variety of sculptures including trees, animals and women playing instruments. The central wing has four cells having side pilasters. The pilasters extend to arches which depict royal scenes. The top of the arch has srivatsa symbol,nandipala, lotus etc. The space between the arches is a long frieze divided into nine cells. The first cell has flying figure with a tray of flowers. The second cell has a herd of elephants and a crowd in combat. The third cell has a man and woman in combat. The fourth cell has a royal hunting scene probably from the Shakuntala story. The rest of the cells are not so clear. The last cell again has a flying figure. The right wing of the Rani Gumpha is a compartment with two plain doors without pilasters and mouldings; the left wing has two rooms,one leading into the other. 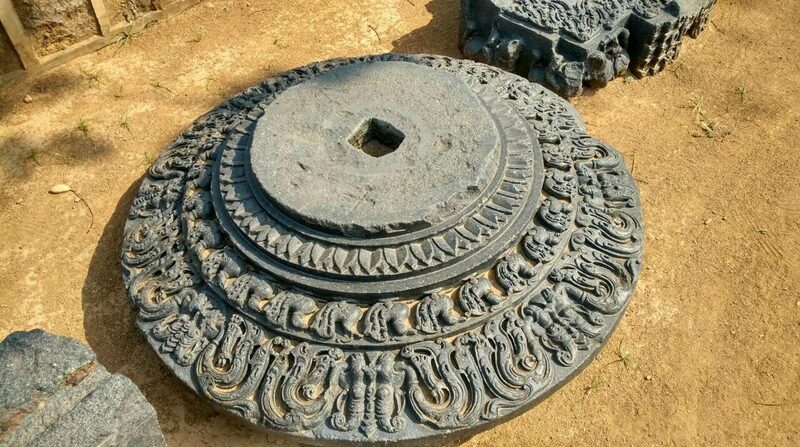 This entry was posted in Ancient Indian history, art history of India, history of india, Kalinga, Kharavela and tagged Ancient Indian history, art history, Kalinga, Kharavela, sculpture on June 6, 2016 by historyreads.